"My grandmother passed this recipe down to me. People who don't even like cabbage love this dish." Dissolve bouillon cubes in water in a large pot over medium-high heat. 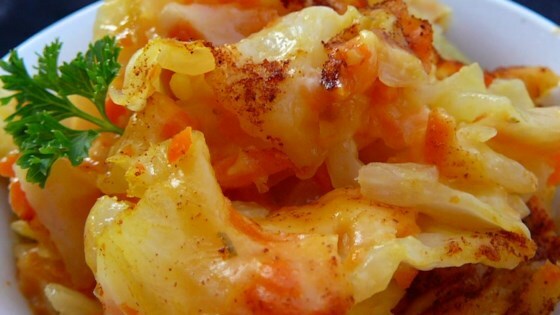 Cook cabbage and carrots in the seasoned water until tender, 20 to 30 minutes. Drain, reserving 1/2 cup of the cooking liquid. Transfer cabbage and carrots to an 8x11-inch casserole dish. Melt butter in a saucepan over medium heat. Stir flour into melted butter until hot, about 1 minutes. Pour reserved cooking liquid and milk into the flour mixture; stir until smooth. Add cheese to milk mixture; cook and stir until cheese is melted and the mixture is smooth and thick. Pour cheese sauce over cabbage and carrots; stir to coat. Season with paprika. Bake in preheated oven until hot and bubbly, 20 to 30 minutes. Made recipe exactly as written except used vegetable bouillon cubes. My husband and I really enjoyed this. I will make again, but will most likely double it to freeze for lunches. Very good! Followed the recipe to a "t" and it came out great. I served this with some kielbasa for a quick weeknight dinner. Yum!